As you know, I was raised in a farming family and then married into a farming family. There are different kinds of farming too! When I was growing up, the farmer that dad worked for milked cows, raised steers, and farmed lots of land. They sold the milk cows in 2000 and after that, raised more steers and farmed more land. When I started dating Jason, I quickly realized that I would be joining a very busy farm family as well. Over the years, they’ve acquired more land and started milking more cows, so they now milk 240 cows three times a day, farm about 1000 acres (it’ll be a bit more next year), and raise about 760 steers. Needless to say, there’s always something for Jason to do–And more-so in the spring! Jason went to college to repair John Deere tractors, so between him and his brother, he often ends up spending lots of time in the spring getting equipment ready. This year, they also had a tractor motor blow up so he’s working on getting that overhauled in addition to the normal upkeep and maintainence. There’s also lots of manure to spread on the fields because it often rains more, which neccessitates more frequent cleaning of the cattle yards. And as always, it always seems like they start some kind of a building or upgrade project–This year they’re putting a new feedermill in so that they can feed cattle at our farm more effectively. While this all seems like a lot, it’s pretty normal practice for other farmers in the area. I was talking to mom this morning on my way home from work and she had told me that Dad had gotten up yesterday at 5 and fed cattle and then hopped in the tractor to spread anhydrous the rest of the day and didn’t get home until 11–AT NIGHT! They’re up against a few days of rain, so it’s really important that they are able to get certain things done to fit with the weather, otherwise it can turn into a super busy, horrible for everyone late planting season. It seems like this winter has been dragging a bit, but slowly, it has been warming up a bit more. This morning on my way to work, I ended up following this tractor part of the way with another truck with two anhydrous tanks behind me. 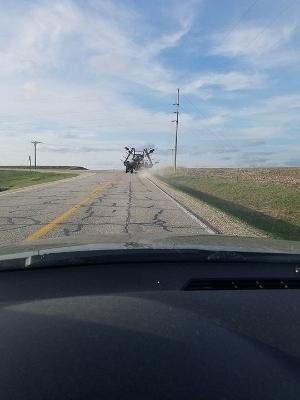 Believe it or not, getting stuck behind a tractor is a pretty common excuse for being a bit late in Iowa, especially close to where I live as the roads are two lane and quite curvy so passing them is not always a possibility. With Jason working all the time and the unpredictability of farming, it’s kind of a toss up as to when he’ll be in for the night and can vary from 8 to 11 (after getting up and out the door by 6 in the morning). Rather than asking him what time he might be coming in, I usually just ask if he is thinking early or late. After about 4 days of a late response, I asked if it was time to quit asking and just assume late. Sadly he said yes…which is quite a bummer, especially working nights (7 pm to 7 am–so he comes in after I leave for work). And so begins the wonderfulness of spring in Iowa! This entry was posted in Uncategorized on April 12, 2017 by Kelli. It all sounds familiar and I’m glad that you and Jason understand that this is the way a farm life goes. It has its ups and downs just like many occupations, enjoy the spring weather. Kim above just said it all pretty well. There is no 9 to 5. It’s more like early to late. It is what it is. A “city girl” might not understand, but you have a good handle on the situation. Yes, even following farm equipment on two lane roads is part of living in farming country. I have spent my fair share of time driving tractors, grain trucks and combines, I love those memeories and you will too. We could use Jsaon! Having problems with our 4250, can’t figure out the fix. No field work where we’re at, so my husband went to an auction and brought home a 6620 sidehill. We now have his and her combines to go with our his and her 4010s. I think we should have his and her quilting machines! Yes, it gets nuts at time, especially when you’re young and can work long hours, but it’s the best life. Definitely the best. I’m more of a city girl but have farms nearby. In this area, people only milk twice a day. How does the three times a day thing work? And do you guys have extra holding tanks? Nobody around here would have room for that much milk and the haulers don’t come that often. This aspect of your article really intrigued me. From your descriptions, Iowa farms are way bigger than the little farms in my area.